What is the goal of a museum? To exhibit excellent antiques and make people feel that museum objects are all very far from their own lives or to protect the value of human culture? People usually focus on very expensive and rare objects but ignore the everyday ones. What makes an object valuable? The price? Why do people find them interesting or important? In the Hairpin Museum the importance of our collections does not depend on their monetary value. We focus on the hairpins in danger. We help the poor hairpins which have almost been destroyed by storage in a bad environment or by inappropriate treatment. We hope we can save hairpins which people think are not important and find the true value of these hairpins, try to find a story behind ordinary objects that women used and cherished every day. There are more than 1000 hairpins in the Taiwan Hairpin Museum. 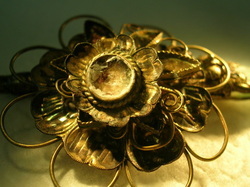 The largest number in the collections are ancient Hairpins from the Ching Dynasty. Our hairpins are made from all kinds of materials with different skills and technology. Our goal is to preserve the hairpin and the culture of how they were used and enjoyed. In our collections we also have contemporary images of women and their hair ornaments in ancient times. It is the best way to show how women used and wore them. In addition to our exhibitions we also provide a conservation service. We have a conservation laboratory and a professional team to conserve ancient objects. If your objects needs help, please contact us, we will try our best to help preserve them.